← This Week…Vote Tuesday and CFM Meeting Wednesday! 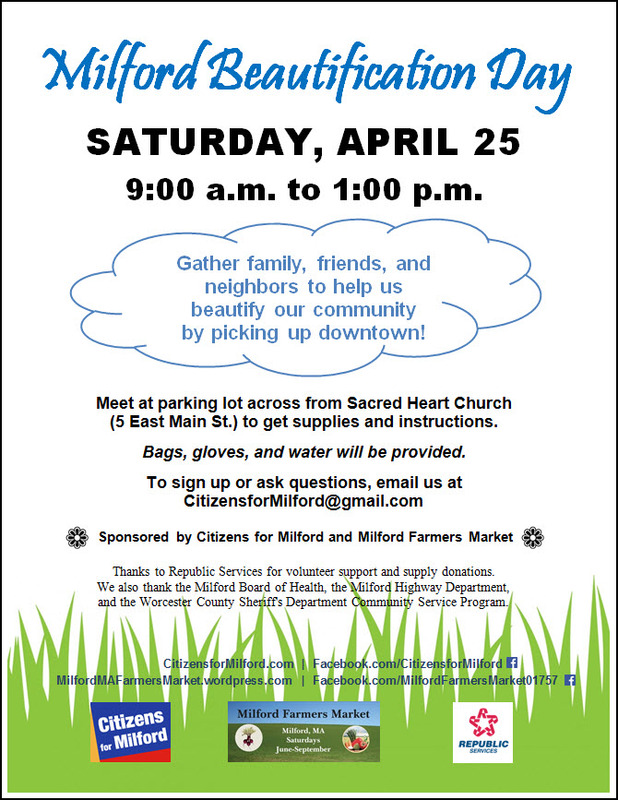 Citizens for Milford and the Milford Farmers Market are organizing Milford Beautification Day, an opportunity for area residents, org anizations, and businesses to work together to beautify our community by picking up trash in downtown. 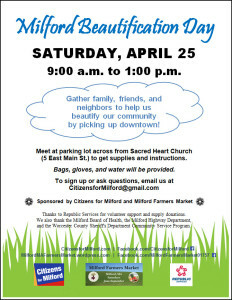 Milford Beautification Day will be held Saturday, April 25th (rain or shine) from 9:00 a.m. to 1:00 p.m. All interested citizens are invited to meet us anytime between those hours in the parking lot across from Sacred Heart Church (5 East Main Street) to get supplies, instructions, and assignments. Trash bags, gloves, and water will be provided to all volunteers. In addition, free t-shirts will be given to the first 100 volunteers who show up. All supplies and t-shirts are being donated by Republic Services. In conjunction with the efforts being organized for Beautification Day, Citizens for Milford has arranged for volunteers from the Worcester County Sheriff’s Department Community Service Program to initiate the Beautification Day work by conducting a clean up on April 23 and 24. Anyone interested in volunteering or participating in any way on April 25—as an individual, a family, or a group—should contact Amie Sanborn by email at CitizensforMilford@gmail.com. Although it is not necessary to sign up in advance, Sanborn notes that having an idea of the number of interested participants can help ensure enough supplies are available. Citizens for Milford is a volunteer, nonpartisan, grassroots organization, which includes a diverse group of citizens who care about our community. In our inaugural year, Citizens for Milford hosted two Candidates Forums, organized volunteers to help plan new decorations for Main Street, and researched and published information critical to area voters on our website. Participation in our projects and events is open to everyone in Milford. More information is available on the group’s website CitizensforMilford.com. The Milford Farmers Market is an all-volunteer, grassroots organization dedicated to providing a venue for local farmers and small businesses where they can sell their products. The group’s mission is to improve access to nutritious food, educate residents about nutrition and agriculture, and conduct outreach regarding community programs. Their secondary mission is to connect groups and people within the town to strengthen community spirit and contribute to a vibrant town center. Information is available on the organization’s website (MilfordMAFarmersMarket.worpress.com) and Facebook page (Facebook.com/MilfordFarmersMarket01757).